Flounder fishing tips to improve your seasonal catch. These Flounder fishing tips relate to the three primary species of Flounder harvested in southern estuaries. The Southern Flounder which has the widest range, is the most commonly caught of the three. The Gulf Flounder, the smallest of the three, ranges along the Gulf of Mexico from Florida through Texas, while the Summer Flounder or "Fluke", an Atlantic coastal inhabitant, are more common in northern latitudes. All three exhibit very similar behavior in feeding habits, seasonal migratory movement, and reproductive cycles thus for the purposes of this discussion they will be treated as one. Flounder begin their lives in offshore regions where spawning has occurs. Flounder larvae look very much like any other newly hatch fry but almost immediately begin a transformation. Carried by tidal currents, they are swept in estuaries where the metamorphosis into the characteristic flatfish appearance continues. As juveniles they are complete recognizable as Flounder and will remain in the estuaries until adulthood. 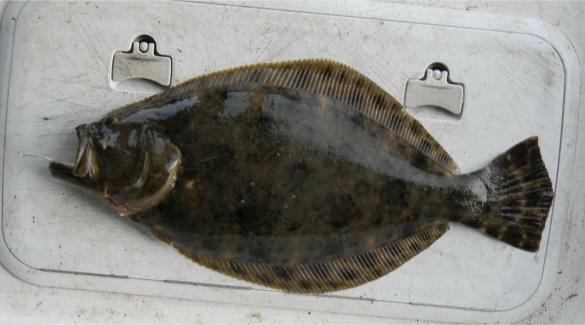 Adult Flounder leave the estuaries beginning in the fall and head to offshore areas. This migration is generally triggered by a weather cold front and often coincides with the exodus of bait fish species such as the mullet making their way to their own offshore regions or other areas. Since bait fish is the primary food source of Flounder, many anglers consider this seasonal migration the prime time to catch large Flounder. Keep in mind that Flounder are not built to swiftly chase down their prey, instead Flounder stealthy follow the bait fish exodus feeding as they go. Lying on the bottom, Flounder are opportunist, patiently allowing their next meal to move within striking distance. The Flounder fishing tips for this time of year include locating sections of the water which form natural choke points or gaps. Flounder will school around these points because the bait is forced to converge together while traveling through these narrowing gaps. In areas that have a clean sandy bottom, slip a free sliding 1 to 2 ounce No Roll tear drop shaped sinker onto the line of your favorite rod and reel. Using a swivel, tie on twenty to thirty inches of 30 pound test monofilament leader line tipped with a 2/0 to 3/0 hook. The idea here is to cast a lip hooked live mud minnow or finger mullet into the choke point gaps. 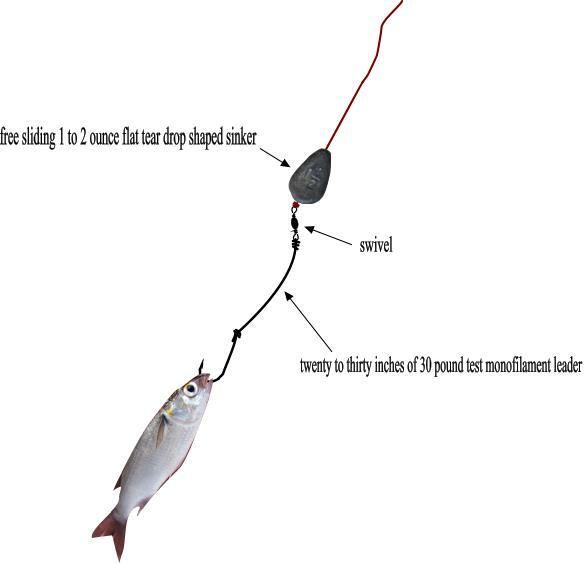 Allow the sinker to settle on the bottom, after a few minutes slowly raise the sinker off the bottom while retrieving three or four feet of line. Once again allow the sinker to settle on the bottom thus pulling the bait down into the striking range of the Flounder. Slowly walking the bait back toward you in this manner covers more ground and increases the chances of a strike. This method is most effective when retrieving the bait against the current so, if possible, set up accordingly. This rig can also be used for slow trolling on sandy smooth bottoms. Flounder fishing tips for fishing over grassy areas or a sparsely debris covered bottom which might cause a bottom fishing rig to get hung up include using a 1 to 2 ounce jig tipped with live lip hooked minnow or tail hooked shrimp. This baited jig must be fished so it is retrieved swimming close to the bottom within the striking range of a Flounder. This method takes a little practice and can work equally will if the jig is rigged with a soft plastic lure. Flounder fishing tips change somewhat in the Spring because these fish, while still offshore, will move onto near shore reefs in preparation for a return into the estuaries. These near shore areas are in relatively deep water generally 40 feet or more. The best bet here is to use a medium to heavy rod. Use a bottom rig to fish straight down under the boat. Fishing straight down under the boat often helps from constantly getting hung up, especially if slowly drifting over the site. A heaver sinker is required to get the bait down to the bottom quickly, generally 6 ounces or more, but otherwise the leader line is about the same as discussed above. The ideal bait is live mud minnows which can be caught with a cast net before you head offshore. Keep in mind that these fish are schooled up so odds are if you catch one there are many other Flounder around. 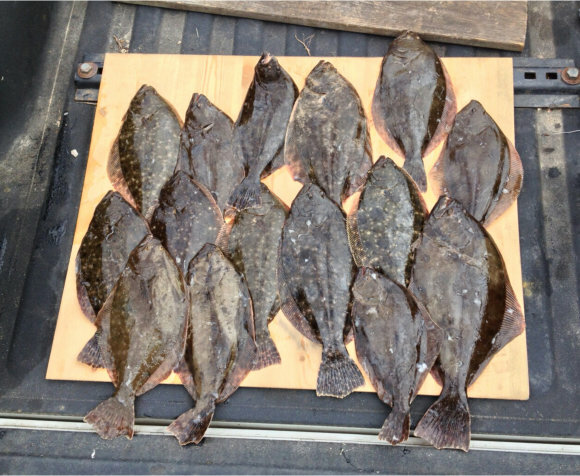 As summer approaches and water temperatures warm, the Flounder will once again move into the inshore bays and channels as well as along the beaches. Look for areas that hold bait fish or shrimp. Use periods of low tide to scout for potholes in the sand created by feeding Flounder before they were forced to seek deeper water because of the dropping tide. Also, look for areas offset from strong flowing currents which hold relatively calm water. Bait fish will often school in these areas and Flounder will take advantage of these spots. Plus, do not over look docks, edges of jetties, or other structures that may hold bait. Bottom fishing rigs and jigs work well in the summer. One last Flounder fishing tip about the end of summer Flounder migration. Because these fish move into the shallows at night to feed, using a spotlight for nighttime Flounder gigging has become a popular method for harvesting these tasty fish.